The Wing has quickly become a co-working hot spot for #girlbosses on the East Coast, with its empowering community members and trendy environment. And the latest outpost (which opens today! ), nestled near the waterfront in Dumbo, Brooklyn, includes new wellness offerings that make it the ultimate healthy home away from office. When you walk into the modern ground-floor space, you can expect pink poured-concrete floors, rich-colored furniture, and all of the signature amenities available at the Soho and Flatiron District locations (or, as the company calls ’em, covens): a cafe with healthy finds like hummus plates, a beauty room featuring high-end products at your disposal (hello, Chanel! ), and a shower room that evokes a spa. What’s especially cool about this new space, though, is its focus on wellness. In addition to new features like a podcast room and a vintage photo booth, the Dumbo location also has a first-of-its-kind wellness room that features a wall of floor-to-ceiling mirrors, a barre, and meditation mats from MNDFL to help you get your Zen on. The room might be small, but it offers a quick escape from your to-do list, providing a place to unwind either by yourself or with your co-working pals. In addition to the wellness room, other perks may also boost your well-being: lactation rooms, a color-coded, female-centric library with hidden doors to phone booths that allow some privacy, and plenty of space to kick back and unwind when you need a break from your work—including a velvet-clad, forest-green sunken living room. 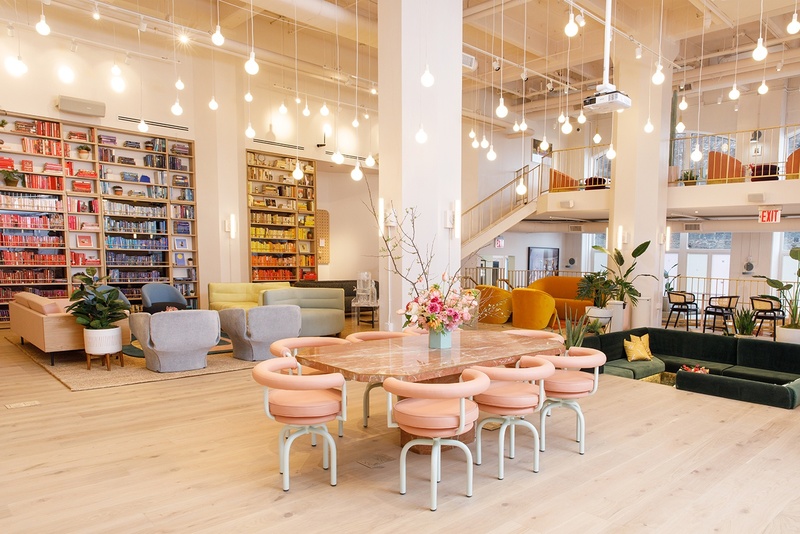 And, considering co-working OG WeWork announced in late 2017 it would invest $32 million in the start-up, there’s a good chance the future holds way more female-fueled wellness at yet-to-be-announced outposts of the Wing. Here’s why wellness apartment buildings are the wave of the future. Or, check out the most important things healthy-home experts do in order to create a wellness pad.